UCVM is designed to be compiled and run on Linux systems. It can also be installed on various high-performance computing machines. Supported by NSF and USGS. The Unified Community Velocity Model (UCVM) software framework is a collection of software tools designed to provide standard interface to multiple, alternative, California 3D velocity models. One important use of UCVM is in high resolution 3D wave propagation simulations for California. UCVM development is an interdisciplinary research collaboration involving geoscientists and computer scientists. 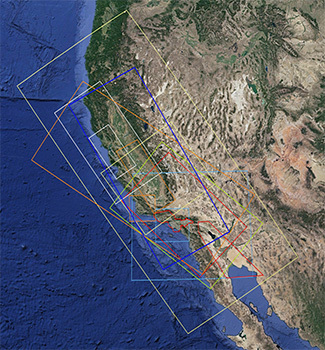 UCVM geoscience research includes identification and assembly of existing California velocity models into a state-wide model and improvements to existing velocity models. UCVM computer science research includes definition of a easy-to-use CVM query interface, integration of regional 3D and geotechnical models, and automated CVM evaluation processing capabilities. UCVM is open-source scientific software designed to support earth scientists, civil engineers, and other groups interested in detailed information about earth properties. UCVM is primarily used by scientists to work with earth material properties on regional scales. The framework also includes key capabilities that are critical for scientists’ ability to run large-scale 3D wave propagation simulations. Please note: If you have come here seeking the version of UCVM that was referenced in the publication, please visit this GitHub page. While the theories and concepts of the UCVM framework have remained consistent across all releases, the latest UCVM releases include significant internal structural software changes that were not included in the version used for the publication. Generate large-scale equivalent material models for high-frequency deterministic wave propagation simulations. Provide a mechanism for delivering, meshing, and visualizing new material model tomographic inversion results (CCA06 and CVM-S4.26). Provide the CyberShake platform with the starting model for PSHA calculations. Visualize and understand differences between models and also better understand how those differences affect seismic hazard calculations. UCVM has been used in many high-performance computations as well as on personal computers to learn and understand about 3D velocity models. Users can download UCVM to their computers to query and visualize 3D velocity models. The platform includes scripts to visualize horizontal slices, cross-sections, depth profiles, basin depth maps, and Vs30 maps. It also includes a command-line utility, ucvm_query, which allows users to provide a model, longitude, latitude, and depth or elevation, and retrieve the material properties at that point in the earth. UCVM also works on many major supercomputers. It has been used to extract meshes that have exceeded 165 billion points and octree databases that have exceeded 14.6 billion nodes. These extractions have been run on the latest supercomputers such as OLCF Titan and NCSA Blue Waters. These meshes were used as inputs for high-frequency wave propagation simulations in order to better understand ground motions. The C API query capabilities of the UCVM version referenced in the publication have been used in CyberShake, SCEC's PSHA software. The C API is used to provide the material model input to the platform so it can run the hazard calculations. The UCVM platform is strictly a software package that standardizes interactions with community velocity models. The models themselves have been developed by many of our contributors. We take this opportunity to thank all of the scientists who have contributed models, data, and computations for inclusion within the UCVM framework. Without their models and cooperation, we could not deliver this comprehensive suite of software utilities to support our research priorities. Ely, G., T. H. Jordan, P. Small, P. J. Maechling (2010), A Vs30-derived Near-surface Seismic Velocity Model Abstract S51A-1907, presented at 2010 Fall Meeting, AGU, San Francisco, Calif., 13-17 Dec.
Pitarka, A., and Graves, R. (2010). Broadband Ground-Motion Simulation Using a Hybrid Approach. Bulletin of the Seismological Society of America, Vol. 100, No. 5A, pp. 2095–2123, doi: 10.1785/0120100057. Wald, D. J., and T. I. Allen (2007), Topographic slope as a proxy for seismic site conditions and amplification, Bull. Seism. Soc. Am., 97 (5), 1379-1395, doi:10.1785/0120060267. Wills, C. J., and K. B. Clahan (2006), Developing a map of geologically defined site-condition categories for California, Bull. Seism. Soc. Am., 96 (4A), 1483-1501, doi:10.1785/0120050179.